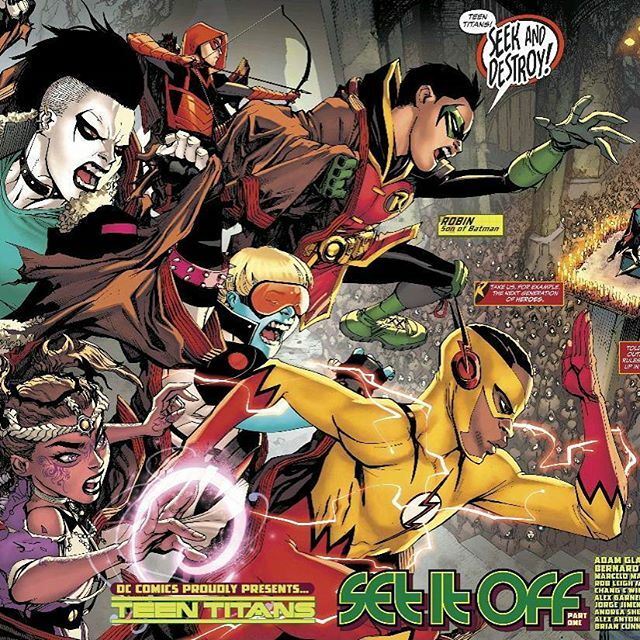 The Titans were back and the Teen Titans were teens again! All was right with the world. Well, except that as exciting as the new teams and line-ups were, the books themselves weren’t much beyond average. Really, the freshness of the titles is what gave them their forward momentum. The Teen Titans line-up starts with Robin, Starfire, Beast Boy, Raven, and Kid Flash, but they soon add Aqua Lad. It’s a great team, really, and I’ve always liked Raven as a teenager, but putting Starfire on the team is a strange move, yet one DC seems intent on making over and over again. The big problem with the new series is the current Robin is Damien Wayne and as much as I love Damien on his own, he’s horrible as a member of a team. He’s obnoxious. The fact that the team lets him stick around (particularly after he forces them together) is questionable. We’ll come back to Damien being awful on a team in a minute. The book is at its best during its crossover with the Titans book and Deathstroke, but that’s understandable as every title that comes into contact with Deathstroke is better for it. The Titans book is a bit more interesting because it’s written by Titans Hunt writer Dan Abnett and he gets to play with continuity more. That’s a big focus for the series. A big reason why Titans is enjoyable is because they did the unthinkable: they got rid of the Wolfman/Perez Titans. Listen, I love that era as much as the next guy, but it had become an albatross for the franchise. Whenever sales dropped or DC wanted to make the Titans relevant again, it was time revisit that same group of characters. It’s like the Titans were forever bound by that group, no matter what they did. They would never truly be able to evolve because at some point they would have to come back to the team that Wolfman and Perez made famous. 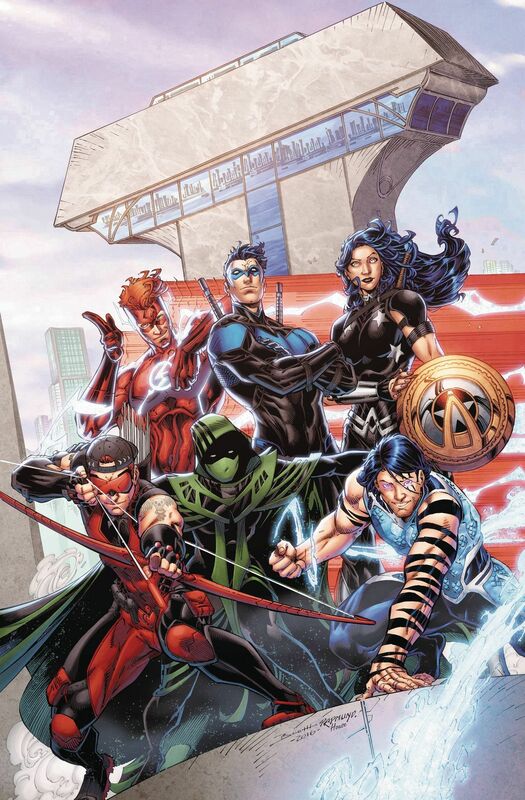 This team consists of the original line-up: Nightwing, Donna Troy, Tempest, Arsenal, and Flash, plus Omen aka Lilith. Bumblebee is pulled in a few issues down the line, too, which makes for a nice, 7 member team. Abnett and artists Brett Booth and Norm Rapmund focus the book on the newly formed New 52/Rebirth continuity, which makes sense given the addition of the original Wally West, as well as the fact that most of these characters hadn’t been seen in the New 52. As entertaining as this angle is, it’s also a problem because any answers to what’s going on in the Rebirth world aren’t going to be revealed in this comic; they’re going to happen in big event comics by DC’s biggest name creators. So far as much intrigue as the creative team is able to generate, none of it pays off. It’s unfortunate, because digging into the mystery of the New 52 would have been a great purpose for the Titans, a team that often has none. And since they clearly weren’t going to be able to make a go of it, the book ended up needing a hook of some kind to replace it. The Teen Titans didn’t really need a purpose beyond teen heroes hanging out. That’s purpose enough. In fact, Johns made that purpose explicit when he relaunched the book years ago. Teen superheroes need friends and only other superheroes understand them. The Titans needed a reason to exist; the Teen Titans already had one. Unfortunately, in the new world order of the DCU their focus had to change. After the overhyped, overrated “No Justice” event that relaunched the Justice League, the two Titans teams found themselves pulled into that orbit. For the Titans, it was somewhat welcome, as they became ostensibly another branch of the Justice League, formed to track down energy from the Source Wall that was wrecking havoc on Earth. It’s a solid reason for the team to exist at least as a starting point. That can’t stay the same forever, though, so it will be interesting to see if it evolves. After all, they have a specific task and either someone figures out how to stop this problem and the team has no reason to exist or it goes on forever which ultimately paints them as ineffective. The line-up that writer Dan Abnett and artist Brandon Peterson put together is a little strange. 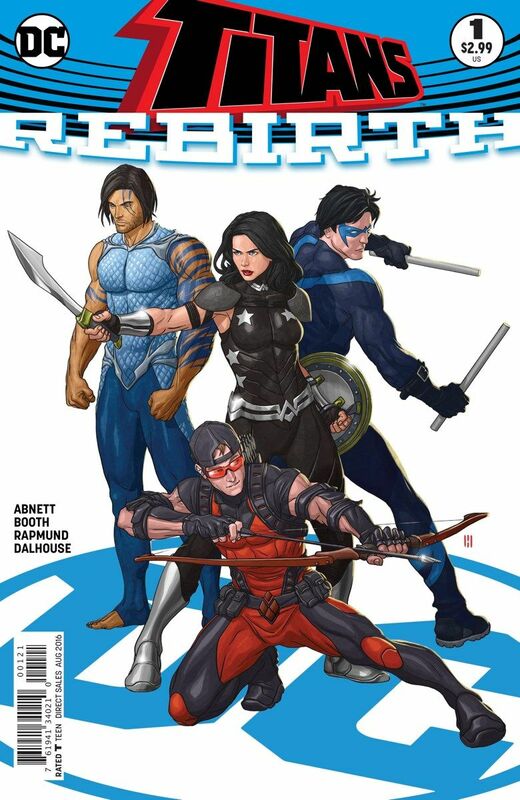 Nightwing as the leader is always welcome and Donna Troy is probably the one current Titan who would could use the most screen time. But Beast Boy and Raven were arguably the two characters who worked well as teens, so suddenly moving them to the twentysomething team is jarring. I like the addition of Steel although I wish they would give Natasha her own superhero name so we can also see her uncle play a part somewhere. The introduction of the New 52 Miss Martian is also a bit strange for much the same reasons as Beast Boy and Raven’s additions to the team are. Miss Martian was a Teen Titan before. Perhaps this version is meant to be more in line with the Young Justice cartoon version, but so far she’s a very different character. But I suppose this is an attempt at moving all the former Teen Titans forward and letting a new generation take over. 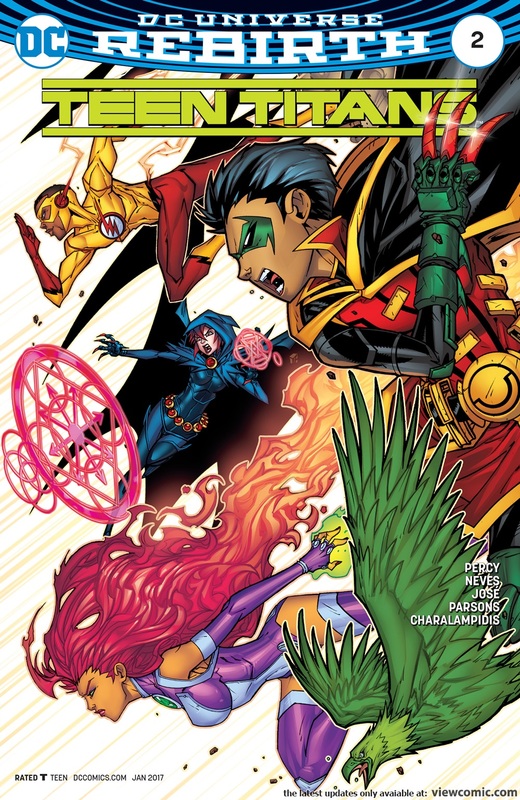 Adam Glass took over as writer of the Teen Titans from Benjamin Percy with issue #20. He’s joined by artist Bernard Chang who does some good work. Unfortunately, he’s shouldered with an awful new direction. After the events of “No Justice,” Damien has decided that the Justice League is, I guess, too soft. So he decides to form an angry team. He gathers Kid Flash, who has some legitimate reasons to be mad if not specifically mad at the Justice League. He gets Red Arrow who is also angry, but, again, doesn’t have any reason to be angry at the Justice League, or even any real reason to want to be on this team. And because apparently there aren’t enough teen superheroes in the DCU to pick from, Damien brings on board three new characters, Djinn, Roundhouse, and Crash (the daughter of Lobo, because what’s an angry team without a connection to Lobo?). Damien has a prison in his basement. Thought I should get that out of the way. If people thought Geoff Johns’ Teen Titans were too dark, Glass is apparently determined to surpass him. And listen, I am onboard with teenagers being angry, but this seems manufactured. Even worse, it’s full of painful, dated attempts at making the team feel like real teens. The best way for adults to write teenagers is to not write them as teenagers, because when they try it is very obvious. I can understand why DC chose to go this route, although it was completely unnecessary. I’m on board with a mandate that all teams have to have a reason for existing. I think it’s long overdue. And I realize it’s been a while since I’ve been one, but I don’t think teenagers need a reason to hang out together. The original Teen Titans certainly didn’t need one. 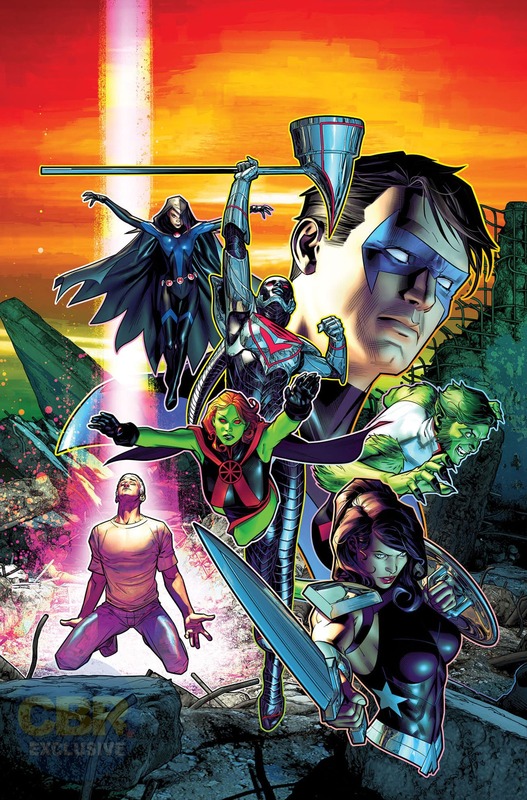 The Titans are unique in comics and an important, vibrant Titans book (or two) are essential for the DC line. Let’s hope DC keeps that in mind going forward. I’ve been “meh” with Bendis on Superman which is way better than I’d anticipated. He’s really starting to slip into standard Bendis, though — bad dialog and crazy padded stories. You know it’s bad when he gets two issues a month and it still feels like nothing happens. He’s also up against a really high bar because I loved the books before he took over.